Slip and slide! It's that time of year again, when a batch of holiday skating rinks pop up around the Sound for kids' and families' skating fun. Some rinks are real ice, some are synthetic, some are outdoor, some are indoor; all help families get into the holiday skating spirit. 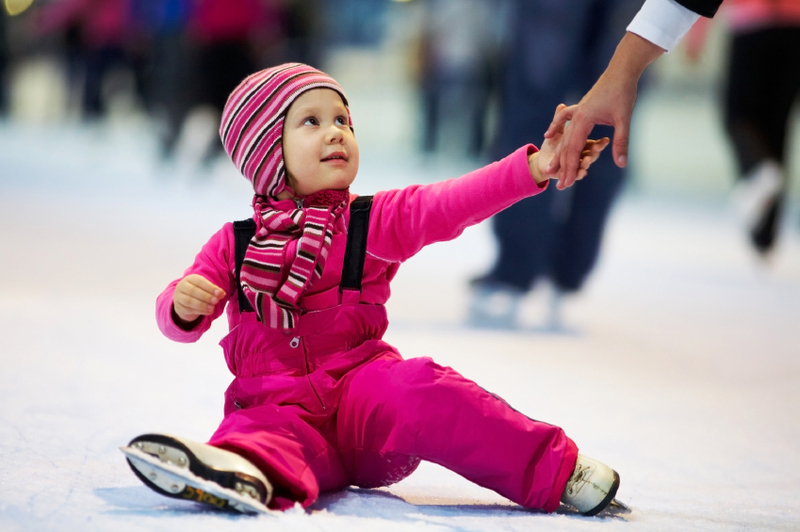 To get started ice skating, take a gander at our 8 pro tips for teaching kids to ice skate. Schedule: Daily through Jan. 13, with hours varying each week. Skating is even open on Christmas! Stroller Skate Thursdays: Skate and push a stroller around the ice skating rink on select Thursdays, view the schedule for times. The small Winterfest ice skating rink in inside Seattle Center's Fisher Pavilion is an indoor rink and a Seattle holiday tradition. It can also be crowded — try a weekday morning. In addition to skating, Winterfest offers five weeks of mostly free special events, concerts and activities. The Armory hosts the expansive Winterfest Train & Village display, which is well worth close study. Winterfest also includes a variety of free performances from late November through the end of December, including children's groups performances, magicians and the one-of-a-kind Nanda, Acrobaticalist Ninja Theater (performing Sunday, Dec. 30 at 3 p.m.). The Armory also offers a wide variety of meal and snack options. Prices: $8 for adults, $6 for kids ages 6–12 and $2 for kids 5 and under (includes skate rental). A limited number of walkers are available for toddlers. A new rink popped up last year in Tacoma, replacing the popular Polar Plaza that used to set up shop in downtown Tacoma's Tollefson Plaza. The new rink is bigger and ready for skaters to get their glide on. Point Ruston shops are open for concessions and holiday shopping. Schedule: Open through Feb. 2, check online for daily hours. This rink is even open on Christmas! Prices: $14 for adults ($12.50 if you bring your own skates), $12.50 per child, with or without skates. Buy tickets at the rink. No actual ice is necessary at Redmond Town Center's nifty synthetic skating rink (so it's not as cold when your bum lands on the ice, err, surface!). Skaters may not be able to perfect their Hamill Camels on this surface, but it works fine for a fun afternoon skate. The rink is outdoors but covered. There's also a holiday horse carousel ($4 cash or check only suggested donation), and a holiday mini train ($4) that takes tots around the grounds. Springfree Trampolines sets up a demo trampoline at RTC during the holiday season; hop in line for a jump session. Schedule: Daily through Jan. 6 (closed Christmas). Check online for daily hours. Price: $7 per session includes skate rental (or bring your own). Ages 3 and older. Thurston County entered the seasonal ice rink game this year, setting up a rink near Capitol Lake in downtown Olympia. The rink is covered but outdoors. There are several options here for getting the littles skating, cheapskate nights on select Tuesdays and helpful staff on the ice. Schedule: Daily through Jan. 6, even open on Christmas Day! Check schedule for daily hours. Price: $12 for adults, $10 for kids ages 4–10 and $3 for ages 3 and under, including skates. Bring your own skates and skate for $9. Cheapskate nights on select Tuesdays and theme nights on Thursdays. An active ice skating rink north of Seattle, Lynwood is an excellent rink that feels a cut above some of the more worn rinks around. There's a warm lobby and viewing area, snack shop, and pro shop, and birthday party rooms. It offers a good Basic Skills program, as well as walkers for toddlers. There is also a hockey program. Skate rental stock spans toddler sizes up to men's size 14. This third-generation family-owned arena (it had the first Zamboni in the region) Highland has seen generations of skaters wobble on its ice skating rink. Highland does not rent walkers — they encourage even small children to try skating. Highland offers hockey programs, figure skating and lessons in addition to public skate sessions. It has a skate shop on site and does offer birthday party tables; no rooms, though. Deals: Family skate sessions, and free skate session on holidays. Check the website for updates. Formerly the Kingsgate Ice Arena, Sno-King Kirkland offers public ice skate sessions, hockey, learn-to-skate programs and fun-sounding broomball where participants do not need to know how to skate. Walkers can be rented; look for group discounts. Centrally located in downtown Everett, the community ice skating rink is just one of the facilities at Angel of the Winds (formerly Xfinity) Arena, which hosts Silvertips hockey games, concerts and more. Street parking can be tricky, but there are plenty of garages. In addition to frequent public skating sessions, junior hockey and learn-to-skate programs are available. Look for Cheap Skate sessions and discounted "Lunch Break Skate" sessions offered weekdays. Located in the Renton Highlands, Sno-King Ice Arena is a year-round, indoor ice skating facility that offers two separate ice surfaces. In addition to public skating hours, they host broomball, figure skating, hockey, lesson series and summer camps. There is a café and game room for family members who don’t want to skate. There is also a skate shop on site. Walkers can be rented. This Tacoma ice rink boasts an "Excellence on Ice" designation from PSA and has an NHL regulation ice surface. Look for Cheap Skate sessions. Editor's note: Writers Gemma Alexander, Tiffany Doerr Guerzon and Nikki McCoy and ParentMap staff contributed to this article, which was originally published in 2012 and updated for 2018.